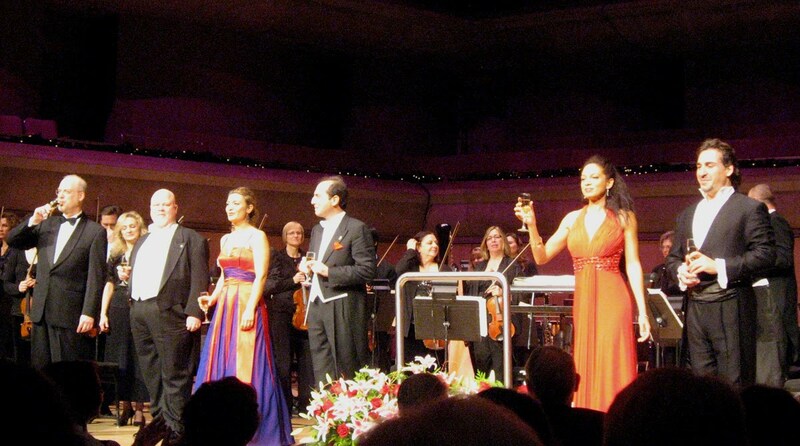 In a few short years, Bravissimo has become quite a New Year's Eve tradition for opera fans in Toronto. This year's edition is particularly stellar, with the participation of two leading Canadians, soprano Isabel Bayrakdarian and tenor Richard Margison joining Italians mezzo Sarah Maria Punga and baritone Alberto Gazale. A 'pick up orchestra' Opera Canada Symphony is led by internationally renowned maestro Daniele Callegari. The turnout was excellent last night, with an almost sold out house. The choir loft was decorated with twinkling lights and the conductor's podium was adorned by a huge arrangement of lilies. Given it was New Year's Eve, the audience was dressier than usual. The evening began with the rousing overture to Rossini's Guglielmo Tell. Often with "pick up orchestras", one doesn't always get the top musicians and the conductor can be a routinier. Nothing is further from the truth here. The orchestra, under the expert baton of Callegari, sounded wonderful, the musicians playing with verve and elan. I spotted some familiar faces in the orchestra, like concertmaster Marie Berard who serves in the same capacity for the COC Orchestra, and violist Douglas Perry. Baritone Alberto Gazale kicked off the singing with verismo gem "Nemico dell patria" from Andrea Chenier, revealing a robust dramatic baritone that did full justice to the piece. (He was equally excellent in "Eri tu" from Un ballo in maschera in the second half) Then it was the mezzo Sarah Maria Punga, in Principessa Bouillion's "Acerba volutta" from Adriana Lecouvreur. It is safe to say this aria is not one of Cilea's most inspired creations in an opera known for inspired melodies - a four minute aria made up mostly of recitative, with a 60 second melody tagged at the end, accompanied by very mediocre and bombastic orchestration. Often the singer has to resort to histrionics to keep the audience's attention. Well, Ms Punga was every inch the diva, playing the drama to the hilt, even if the vocalism was marred by an unsteadiness and pronounced vibrato in long held notes, a pushed chest register, and a general lack of squillo at the top. 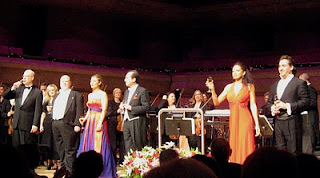 Canada's own Isabel Bayrakdarian sang the perennial favourite "Song to the Moon" from Rusalka with gleaming tone. "O souverain" from Le Cid was delivered with aplomb by Canadian tenor Richard Margison. The trio from Act 3 Butterfly with Suzuki, Sharpless and Pinkerton doesn't really work as a stand-alone excerpt in a concert performance, billed as "opera's greatest hits." It must have been Margison's first Pinkerton in many years, and Punga, who used the score, likely had not sung Suzuki onstage before. The first half ended with the obligatory "Nessun dorma" by the tenor. Margison ran into some momentary raspiness, but overcame it and finished the aria without incident. The audience, as expected, gave him a big hand. The second half opened with an orchestra excerpt from a zarzuela by Jeronimo Gimenez, a piece new to me. The it was Punga's over-acted and rather under-sung Habanera from Carmen, followed by the Don Jose-Micaela duet. I don't think Don Jose is in Margison's active repertoire, and to my knowledge Bayrakdarian has never sung Micaela. The two voices don't blend very well in this duet, with the tenor's stentorian tones, so effective in Calaf's aria, overpowering the delicate passages here. Bayrakdarian's tackling of the fabulous coloratura showpiece "Tanti affetti" from La donna del lago makes one wish that she would go back to the bel canto repertoire that once figured prominently in her career. Margison was in his element in a searing "Vesti la giubba." The Flower Duet from Lakme was cut for unknown reasons. The concert ended with the quartet from Rigoletto. The casting of Gazale as Rigoletto and Punga as Maddalena were spot on, and they both delivered, with Punga doing her best singing here. I never thought I would ever get to hear Margison as the Duke, or Bayrakdarian as Gilda, but they were both game, with Margison delivering a very credible opening to "Bella figlia dell'amore". There was the obligatory encore of Libiamo from La traviata, this time with the soloists sipping champagne during the proceedings, a festive end to a very enjoyable concert.